Hard to believe it, but it’s September already, which heralds a brand new fall season. This month on MMOCO, we’ll be looking at the console release of a new piece DLC for Elder Scrolls Online, a new raid for Secret World Legends, and a new water powerset for DC Universe Online. 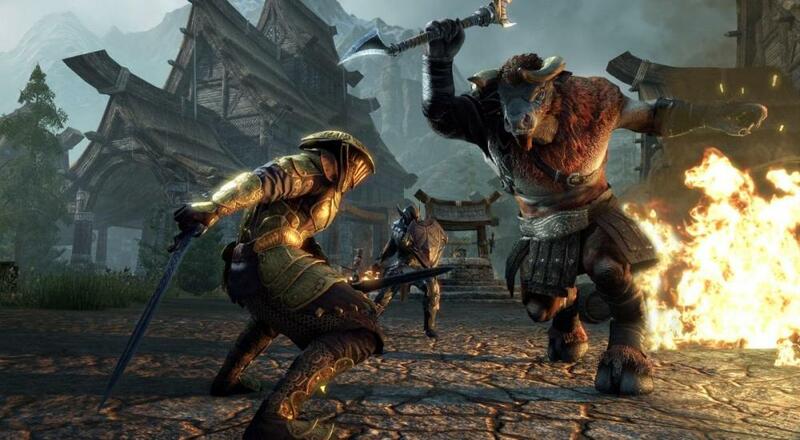 The new “Horns of the Reach” DLC for Elder Scrolls Online (ESO) launched on Mac and PC in the middle of August, but it took a couple more weeks for it to arrive on the consoles. Now it’s available for all players, regardless of their platform. As with most of the DLC packs for ESO, “Horns of the Reach” adds a good amount of content. This time, two new 4-player dungeons have been introduced (Bloodroot Forge and Falkreath Hold), both focusing on the Dreadhorn Clan. Both dungeons offer new item sets, monster masks, achievements, and collectables. They can be accessed either by visiting them on foot in their Craglorn zone locations, or queueing for them in the Group & Activity Finder. This DLC pack is included for free with an active membership of ESO Plus, or can alternatively be picked up for 1500 Crowns ($15). There’s also a limited edition “Horns of the Reach Collector’s Bundle” for 3500 Crowns that comes with the DLC as well as a new mount (the Karthwolf Charger), a new pet (Karthwolf Shepard pup), and five Crown XP Scrolls.